Dundonald faced an Eyemouth team going through a rebuilding process for the right to play Crossgates in the second round of the King Cup. Dundonald had the opposition under pressure from the start and it was no surprise when Campbell latched onto Rogerson's fine pass to give them the lead. The same two players combined again for Dundonald's second but this time it was Campbell who provided the cross for Rogerson to score at the back post. Rogerson scored again from close range to increase Dundonald's lead. Eyemouth where struggling to create any chances at this point and fell further behind when McKenzie scored after the Eyemouth keeper had made a good save from Smith's initial shot. McKenzie scored from the edge of the box before Rogerson set up Campbell for his second as the scoring hit seven. Moments later Campbell scored again to get his hat-trick. McKenzie scored another before Rogerson scored with a penalty to get his first hat-trick for Bluebell. McKenzie completed the rout when he got his fifth and Dundonald's thirteenth. ​This game was over in the first ten minutes but full marks to Eyemouth's young team for keeping on going and trying to make a game of it. This Saturday Bluebell travel to Dalkeith Thistle for a Conference B fixture. 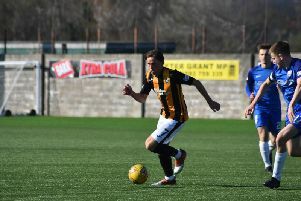 Kick-off 2.30 p.m.
​Dundonald: Lennox, Durie, Drummond, Walton, Wallace, Gay, Courts, McKenzie, Rogerson, Smith, Campbell. Subs: Lee Dair.